Martha Harris Strong. 1940s. Photograph. Martha Harris Strong, Diaries, 1922–1995. On New Year’s Day 1922, Martha Harris Strong began a lifelong habit of noting the day’s events in a diary. By 27 November 1995, her ninety-third birthday and the day she died, Mrs. Strong had filled 67 volumes of composition books, appointment books, notebooks, and diary volumes. She commented on events in her home at Beaverdam in Hanover County, the changing seasons, and details of rural life. She also included household tips, such as concoctions that cured headaches or foods that caused arthritis. Daily records such as Martha Harris Strong kept are invaluable research tools for historians. 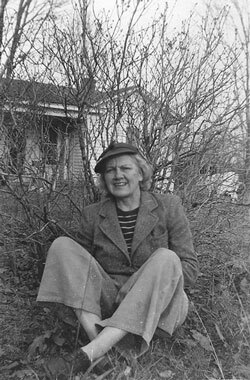 Mrs. Strong’s diaries document one person’s life in rural Virginia for much of the twentieth century during which technological innovations increased the pace of life and expanded connections between communities.